ItemI-61753 - Beatrice James, mother of Phyllis Munday, with Esmee (Betty) James (later McCallum) beside her and Girl Guides of the Second Vancouver Company; box 38 "Guides". ItemI-61678 - "Throwing the diamond hitch"; Don Munday on left and companions loading packhorses; possibly on Garibaldi; box 36. ItemI-61679 - Climbers around the campfire, Garibaldi; box 36. ItemI-61680 - Phyllis Munday tending the cook-fire; possibly at Garibaldi camp; box 36. ItemI-61681 - A female climber, possibly Esmee (Betty) McCallum, with pack and ice axe at what may be Garibaldi; box 36. ItemI-61683 - Phyllis Munday, on right, and companions at camp, Garibaldi; box 36. ItemI-61653 - Climbers on snow; Garibaldi; box 36. ItemI-61654 - BC Mountaineering Club members in a handmade boat, possibly the Alpine Beauty, Daisy Lake, Garibaldi; box 36. ItemI-61770 - Phyl Munday cooking on campfire, Don Munday observing; on the trail, Golden Ears; box 38 "Golden Ears". 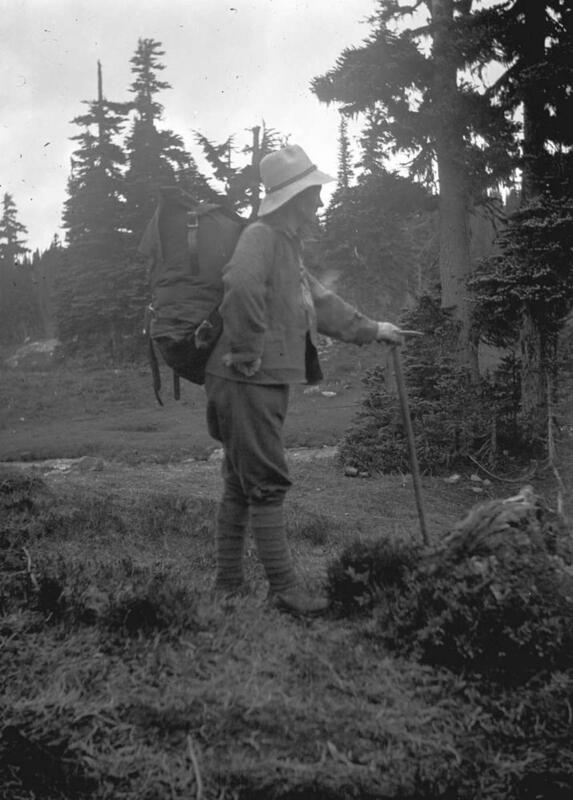 Item I-61681 - A female climber, possibly Esmee (Betty) McCallum, with pack and ice axe at what may be Garibaldi; box 36.